Nobody likes to be told about technique, either! Sometimes, though, poor technique is the reason an instrument buzzes. In fact, technique is a really important cause of buzzing. 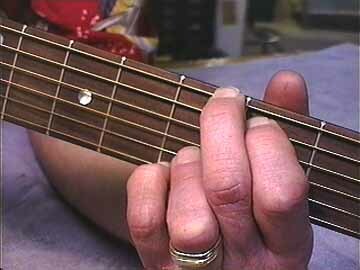 At that distance it's difficult to get good contact with the fret. 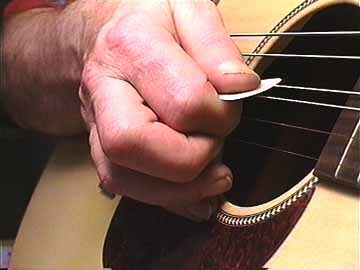 Picking a note with the pick held at this angle will cause the string to vibrate straight up and down, making it much more likely to buzz against the frets. Playing technique is a supremely important part of buzz diagnosis. When I'm talking to a musician who has continual buzzing problems in spite of my efforts to set up the instrument, I'll have him play another similar instrument to see if it buzzes, too. If he tries out several and they all buzz, he's likely to hit on the idea that his technique is to blame. For more detail on this topic, check out Technique for Tone, It's in Your Hands.